Dominic Hofstede is a Melbourne-based graphic designer, educator and researcher. He is a Adjunct Senior Research Fellow with Monash Art Design and Architecture and in 2009 he initiated Re:collection as an online archive of Australian graphic design from the 1960s–>1980s. How do we define Australian Graphic Design? I simply hate this question, not only because it appears so predictably in this and similar magazines, but more annoyingly as I am unable to answer it. Is our industry still so immature that we need to continually query its authenticity? We love comparisons in Australia. Moreover, we suffer from a chronic condition; cultural cringe. Let me indulge in a little personally. It would indeed be rare to find Italians, Japanese or the Dutch asking themselves such a banal question. They just know instinctively, or to quote a line from a very ‘Australian’ film, The Castle, ‘It’s the vibe of the thing your Honour’. I wonder, are we any closer to defining our identity now than we were ten, twenty or thirty years ago? Are contemporary designers inherently more Australian in their work than their predecessors? Furthermore, and to persist with this line of questioning your Honour, just how far has our industry progressed along the evolutionary scale? If the yardsticks of maturity are an understanding, respect and recognition of history, then we are still in utero. To illustrate this point, and to be fair this question is directed specifically at an Australian readership, how many of the following names are familiar? Geoff Digby, Alistair Morrison, Brian Sadgrove, Frank Eidlitz, Lyndon Whaite, Jimmy Haughton James, Bruce Weatherhead and Alex Stitt, Geoffrey and Dahl Collings, Arthur Leydin, Douglas Annand, Eric Maguire, George Kral, Lance Stirling, Max Forbes, Gordon Andrews, Richard Beck and Les Mason? All are worthy AGDA Hall of Fame inductees1, selected for their ‘powerful contribution to the profession, producing uniquely high standards of work, and influencing greatly their contemporaries and following generations’. Les Mason, arguably the most significant figure in this illustrious list, passed away less than six months ago. Therefore, in the context of these complex questions of identity and maturity, it is worth reflecting briefly on his career. 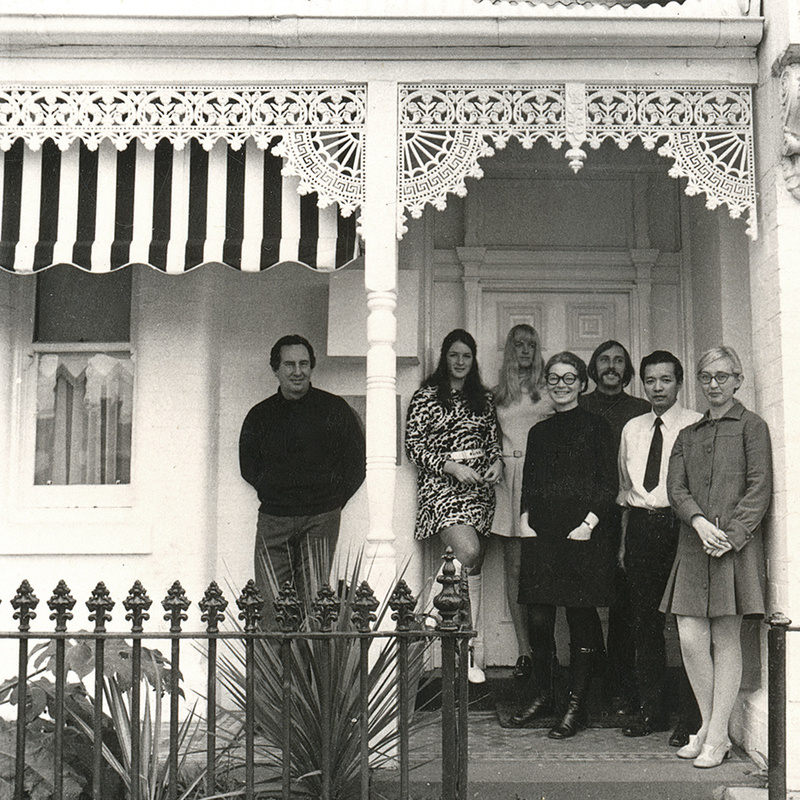 Les Mason and his studio members on the porch of 72 Eastern Road, South Melbourne, c. 1960s. Photograph: Csaba Banki. Mason arrived from Los Angeles in 1961, exuding a charismatic bravado, shaking the polite civility of the industry at that time. He would become the fulcrum for a new wave of young designers, acting not only as a mentor and teacher but also as an inspirational figurehead. Garry Emery was one of those young designers and he said of Mason, ‘he was the most informed person that I have come across, and he was the one that really built bridges for me, made design legible so that I could grasp the social connections’.2 To Emery, other esteemed alumni including Brian Sadgrove, Lyndon Whaite, Bruce Weatherhead and countless others can be added. Mason’s art direction of Epicurean, the magazine of the Food and Wine Society of Australia, is seen by many as his defining work. It seems that Mason had an unusually enlightened client in the magazine’s founder and owner, the late Alan Holdsworth. He gave the designer a mandate to experiment freely, and the resulting publication is a design tour de force, a perfect distillation of Mason’s unique cornucopia of skills. Reflecting on Mason’s American heritage, it is interesting to note that his work is imbued with a confidence, verve and unrestrained vitality, characteristics that could easily be identified as uniquely ‘Australian’ traits. Reflecting on Mason’s American heritage, it is interesting to note that his work is imbued with a confidence, verve and unrestrained vitality, characteristics that could easily be identified as uniquely ‘Australian’ traits. Mason’s reputation reached well beyond his adopted homeland, a claim validated by the frequency with which Epicurean appeared in respected international design periodicals such as Graphis. The magazine gave Mason a cover and feature article in 1974.3 Brian Sadgrove’s accompanying text describes the ‘sense of adventure’ and ‘irreverence’ evident in his work. This sounds pretty Australian, huh? I doubt whether many young designers will be familiar with Mason, and certainly would not recognise a piece of his work. This lack of knowledge could easily be attributed to the lazy disposition of GenWhyShouldIBeBothered? However, is the resource available? If perchance a motivated and self aware young designer was interested in researching industry pioneers such as Mason, they would find very little information in print or online. Esteemed design writer Rick Poyner visited our shores in 2001, only to face the same frustration. He noted as much in his excellent article ‘Look inward; graphic design in Australia’ (Eye Magazine #46). Poyner attributed the dearth of information to ‘Australian design’s tendency to underplay itself’ and wrote ‘there are surprisingly few sources of information about Australian Graphic Design. Geoffrey Caban’s A Fine Line: A History of Australian Commercial Art, published in 1983, is the only detailed general study but has long been out of print; nothing comparable has since appeared’. The paramount importance of having historical perspective in an Australian context which adds to our sense of place, our sense of national esteem and an understanding of certain individual’s contribution to the professionalism of design here in Australia. Graphic Design will disappear as a stand-alone profession if it does not have a well-founded history or heroes. An engagement with our past is essential to the development of a self aware, confident and mature profession. By listening to, and learning from, the Leydins and Masons of our craft hopefully one day the question of identity will be answered. More importantly, we will no longer feel compelled to ask it. This essay was first published in Process Journal #1, 2010.